Mikael Persbrandt, Trine Dyrholm, Birgitte Hjort Sørensen et al. World famous singer-songwriter Thomas Jacob (Mikael Persbrandt) lives in Los Angeles. He is a successful man with a lot of burned bridges. After years abroad Thomas travels back to Denmark to record a new album. There, his estranged daughter, Julie (Birgitte Hjort Sørensen), suddenly turns up with his 11 year-old grandson, Noa (Sofus Rønnov). Soon - and very much against his will - Thomas is forced to take care of the boy. Against all odds the two of them slowly begin to connect through music. But disaster strikes, forcing Thomas to realise he has to make a choice that will change his life forever. 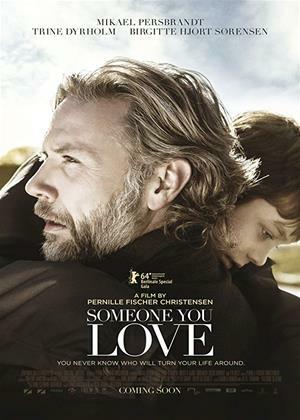 "Someone You Love" is an emotional drama about discovering love within oneself and finding a way back to life.